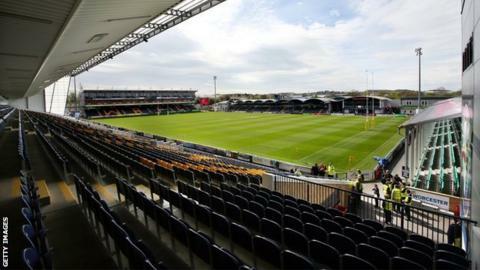 Worcester Warriors were made to work as hard as they have done all season in beating Doncaster 25-5 at Sixways to go top of the Championship. Having played with a strong wind at their backs, the Warriors turned round only 5-0 up at the break. But flanker Sam Betty scored two of their four second-half tries as Worcester claimed a 19th straight win. "That's as hard as we've worked. That game was up for grabs at half-time," said boss Dean Ryan. He told BBC Hereford & Worcester: "I'm just pleased to get through it. We showed real character to play into that wind and take the game from them. "It was a strange game. Fair play to Doncaster. It was difficult to get the ball point off them but, when we finally got the ball, we showed what we can do." It took until six minutes before half-time for the Warriors to break the deadlock, when centre Max Stelling went over on the right for his 10th try of the season. And they led only 5-0 going into the final quarter before hitting Doncaster with a burst of four tries in eight minutes. Flanker Betty crossed twice to take his tally to 13 for the season, either side of one from left winger Tom Biggs. Prop Mike Daniels, on as an early replacement for Nick Schonert, then stole the show, running fully 70 metres to score. On a day when kicking was made very hard by the icy north wind blowing at Sixways, Ryan Lamb was off target with all five conversion attempts. It was the same story when Doncaster grabbed an unconverted consolation try through Ross Davies with the final play of the game. Worcester's 11th bonus-point victory in 13 matches took them back top of the Championship table. Bristol were expected to return to the summit as they played Cornish Pirates on Sunday, but Andy Robinson's side lost 45-38 - and now trail Worcester by a point. Worcester: Howard; Hammond, Stelling, Symons, Biggs; Lamb, Arr; Bower, Creevy, Schonert; Williams, Thomas; Senatore, Betty, van Velze (capt). Replacements: George, Porter, Daniels, Sanderson, Mulchrone, Mieres, Grove. Doncaster: Jarvis; Flockhart, Bulumakau, Armitage, Lewis; Francis, Maplesden; List, Hunter, Quigley, Hotson, Phelan, Challinor, Hills (capt), Shaw. Replacements: Bergmanas, Veikoso, Davies, Eggleshaw, Clark, Fosita, Hoadley.